Southeastern Pennsylvania is a beautiful part of the state, and the countryside is amazingly picturesque. Scenic drives, lovely farms, charming towns and historic stone houses and barns make this area a wonderful place to explore. We ventured out from Lancaster County to discover more of Pennsylvania. On our way to Valley Forge, I had suggested that we make a slight detour to visit Hopewell Furnace National Historic Site. I had read that Hopewell Furnace was one of many “iron plantations” that produced iron goods during the early nineteenth century, and it seemed like an interesting place to visit. When we approached the park, however, we found the gate closed. How disappointing. Not only did we not get to visit the park, but I couldn’t even get my passport stamp. ﻿We later found out that the park is closed on Monday and Tuesday in the off-season. Another lesson learned – this time of year we need to check whether places are open before driving out of the way to see them. At least the drive there was pretty, despite the widespread damage to trees from the storm. It continued to amaze me how many branches, or entire trees, had simply snapped. Many roads were still closed, and trucks from the various power and telephone companies were still repairing lines. Valley Forge National Historical Park was open, and there we re-learned the story that every school child is taught. We already knew that Valley Forge was the site of a winter encampment of soldiers during the Revolutionary War. Valley Forge is particularly known for the hardships that the men endured, suffering from scarce food and clothing. ﻿But Valley Forge is about much more than hardship and misery. Through an orientation film, exhibits and a self-guided tour, we learned more about the significance of the encampment and how it fits into the context of the American Revolution. We learned about the character of the soldiers who comprised the Continental Army and how they developed into a highly trained force during their winter and spring at Valley Forge. Valley Forge was another national park well-worth the visit. Before we left Lancaster County this morning, we had looked for a campground near Valley Forge. We are very aware that many campgrounds are closing for the season today, or have already closed. Tim found a KOA campground in the area, and although it was scheduled to close, the owner had decided to keep it open a few more days. I’m not sure we had ever planned to stay at a KOA, but we found the Philadelphia/West Chester KOA to be a beautiful campground. We were placed in one of the deluxe sites, with our own stone patio, table and chairs, barbeque grill and lovely view. After dealing with muddy sites the last few days following the storm, this bit of luxury was welcome indeed. Kitty, Tim and I wish everyone a Happy Halloween. Even though Kitty may not look very happy in these photos, she assured me that she did have fun dressing up in her costumes. I think she makes a fabulous pirate. Tim thinks I’m nuts and has accused me of Kitty abuse. I don’t know what he’s talking about. What Damage Hath the Storm Wrought? We awoke to a beautiful morning, with bright blue skies and snow coating all of the trees. The sun quickly melted the snow on the trees, but the ground was still covered with several inches of snow throughout the day. Several driveways at the campground were blocked either by broken limbs or overhanging branches that were heavily weighted down by snow. Some RVs even had to be pulled out from their campsites. ﻿Although we had heard on the news about the damage to trees throughout the storm-affected area, we were unprepared for the extent of the downed and broken trees on the back roads. One of the roads we tried to enter was closed, and others were littered with large branches. We saw one tree resting on a power line. We literally drove into an overhanging branch when traffic prevented us from avoiding it. Oh well, the Kat Karrier is going to get a few battle scars. We spent the afternoon at the mall in Lancaster, dealing with a few technology-related issues. Lo and behold, we were successful in resolving them. We made it back from the nearly-frozen. By mid-afternoon, the power at the campground had been restored, and we were able to fill the tank with propane. It took a while, but we were finally able to warm up the RV, and even Kitty was able to come out from hibernation. ﻿It’s beautiful outside, but six inches of snow is not what I had in mind for October, or any month on the road for that matter. Our goal had been to avoid snow and freezing temperatures at almost all costs. Is It Fall, or Winter? We have learned a good lesson, however, and that is to make sure the propane is full when colder weather is predicted. The furnace can really consume propane quickly when it’s very cold outside. Although we were uncomfortable, I felt especially bad for all of the folks who had come to the campground for Halloween weekend. Apparently, this is a hugely popular camping weekend in the Northeast, and the campground had planned all sorts of activities. Most of the other campers who arrived yesterday had gone all out in decorating for the holiday. There were a lot of disappointed families here today. Many, in fact, packed up and left. We’ll plan to celebrate Halloween in the next day or so. Kitty’s costumes are waiting for her. It’s been snowing all morning, the wet and heavy kind. We have several inches on the ground already, and it’s not showing any signs of letting up. The snow is closing in and the roads are icy. The power is out at the campground. We’re almost out of propane and can’t refill unless the power comes back on. Our 12 volt coach battery has almost completely discharged. It’s 50° inside the RV, and we can’t run the furnace. We’re using the cat to keep warm – I knew there was a reason we brought her along. We’re slowly freezing. This may be our last post. Hopefully, someone will find our frozen bodies. Farewell. Happy Halloween. Why Are You Walking Me In the Snow? Don’t get too excited. I have nothing to confess. We just happened to attend The Confession, which is a musical, this afternoon. The musical is an adaptation of a trilogy of bestselling Amish novels and was presented in Bird-in-Hand, Pennsylvania. This Amish love story was quite well done, and Tim and I both enjoyed it. Although fictional, the story did give us some insight into Amish life and customs. We spent the morning at Miller’s RV Service Center, where we met with a technician who has promised to take care of our leaks next Tuesday or Wednesday. Although that’s still a wait, it’s better than the two to four week window we’ve been given by other centers. Miller’s is a small, family operation, and Tim and I both got a good feeling about the operation. In between Miller’s and The Confession, we were able to drive some of the back roads in Amish country. Lancaster County, Pennsylvania, is a beautiful area, and the morning was beautiful, with bright blue skies. We saw many horse-drawn carriages and both children and adults on scooter-bikes. We feasted on local home cooking for dinner, including stuffed cabbage, ham and scalloped potatoes, stewed tomatoes, sweet potatoes and homemade pumpkin pie. I had to take a tiny shoo fly pie home with us. This is a dessert that is a trademark of Amish cooking. It is similar in texture to a coffee cake and has a gooey molasses bottom with a crumbly brown sugar topping. It’s a bit too sweet for me, but I wanted to try it. Tonight we are waiting for snow. We awoke to another rainy day. Not only rain, but also fog, which never seemed to lift throughout the day. Tim and I are growing a bit tired of the wet weather, with more rain than usual for this time of year. The tradeoff, I guess, is that temperatures in the Northeast have been much warmer than usual this month. That’s been a very good thing. A freeze warning, however, has been issued for tonight, which will be our coldest night so far. Snow is even predicted for Saturday, although it’s not supposed to last. We’re going to have to think about heading south before too long. But enough about the weather. Today was all about chocolate. 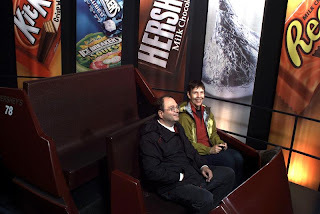 We spent much of the day in Hershey, Pennsylvania, at Hershey’s Chocolate World. We took Hershey’s Great American Chocolate Tour, which was a real hoot. The tour was a ride that followed the cocoa beans on a journey from the tropical rainforest to the processing plant at Hershey. The ride explained the process of making chocolate and was really a lot of fun. Yes, I know that’s hard to believe, but I really had fun on the ride. Go figure! Who knows what I’ll have fun with next. ﻿After our tour we had to stock up at the shop, which contains the world’s largest selection of Hershey’s products. Not that we can’t purchase chocolate at almost any store, but shopping here just seemed the thing to do. Besides, it gave us the ingredients for our own chocolate tasting later. Reese’s Peanut Butter Cups are winning so far. ﻿Before we left town, we stopped at the Hotel Hershey, another grand, historic hotel that has been beautifully preserved. The hotel is perched on a hill overlooking the city. The impressive Fountain Lobby, inspired by a Spanish-style courtyard, is a wonderful space. ﻿﻿We had hoped to enjoy a lovely tour through the Amish countryside of Lancaster County this afternoon, but could see little because of the rain and fog. Instead, we ended up at BestBuy where we purchased a new camera. A little retail therapy is not a bad thing on a rainy day. Besides, we have hardly shopped on this trip. We’ll see if the quality of the photos improves after today. We spent much of the day at Steamtown National Historic Site in Scranton, Pennsylvania, a park devoted to the story of the steam railroading in America. The park is only twenty-five years old and was very controversial when it was created in 1986. Some questioned its historic significance and the quality of its collection, but the park has grown in popularity. For a train buff, it’s a great place to spend a good part of a day. Steamtown includes a portion of the Scranton railroad yard of the Delaware, Lackawanna and Western Railroad, which was one of the earliest rail lines in northeast Pennsylvania. The heart of the park is a roundhouse and turntable that display many of the steam locomotives that are part of the collection. What I think is so cool is that Steamtown is still a working railroad site. ﻿ ﻿We also enjoyed exploring the exhibits at the history and technology museums, which are very well done. All facets of railroad history and life are interpreted here. Of course we also had to pose with many of the “people” who worked on or were connected to the railroad. We can’t seem to resist cheesy photographs. After a most enjoyable visit, we drove south through the Lackawanna Valley and coal country. We wanted to get close to Hershey, Pennsylvania, where we will be tomorrow. Oh boy, chocolate. I can’t wait. Today we seemed to drive around in circles, never seeming to find what we were looking for. We still had a good time and just laughed at the absurdity of it all. The day started on a promising note. The weather was gorgeous, and we drove down to see the Delaware River, which is the only river east of the Mississippi River that has not been dammed. We had hoped to cross the river at the town of Dingmans Ferry, but the RV was a bit too heavy. Actually, we only wanted to cross because it would be a novelty. The Dingmans Bridge, built in 1900, is one of the last privately-owned toll bridges in the nation. It costs $1.00 to cross each way. ﻿We drove south through the Delaware Water Gap National Recreation Area and caught glimpses of the river from time to time. We wanted to visit the Delaware Water Gap, and I wanted to find the National Park Service visitor center so I could get my passport stamped. Never has a visitor center been so difficult to find. We took one road and then another and nothing, zip! Lucy, our harebrained GPS unit, was no help either. She routed us along a beautiful road, and we did drive through the Gap, but never found the visitor center. I finally gave up and told Tim to just leave. We got on the interstate, and lo and behold, we saw a sign for visitor information. We made a quick exit, missed the left turn and ended up on a hilly, one-lane road controlled by a traffic light that changes only once every three minutes. We finally got our green light, drove up the hill and were able to turn around after a mile or so. We headed back down, and as we rounded a bend, there in front of us was the visitor center. I got out of the RV with my passport book in hand, ready to get my stamp. The visitor center was . . . closed! Nooooo . . . How cruel! By then, it was too late to go anywhere else, so we found a nice campground in the Poconos and relaxed for the rest of the afternoon. We deserved it! We had planned to turn south toward Pennsylvania yesterday, but this trip is all about seizing the moment and altering plans as the mood strikes us. And that’s exactly what we did yesterday. Tim had second thoughts about leaving New York without seeing a bit more of the state, so we ventured north toward Lake George in the Adirondacks. Lake George is a large lake on the eastern edge of the Adirondacks and is one of the prettiest lakes in the region. We settled into a little cottage not far from the lake when we arrived so Tim could watch afternoon football. This morning we drove farther north and circled back around the west side of Lake George. It turned into a beautiful day after the early fog burned off, and we were still able to see quite a few fall colors as we drove along the lake. The views across the lake were gorgeous. We made a detour to Bolton Landing to take a look at the Sagamore, one of the grand historic hotels that now also serves as a conference center. The hotel is beautifully preserved in a wonderful setting. Today was the longest driving day since Tim arrived – 272 miles. We wanted to make it to Pennsylvania and the Delaware Water Gap National Recreation Area, which is just over state line. Therefore, we spent a lot of time on the interstate. It really wasn’t so bad. I wouldn’t like to make a habit of it, but every once in a while, we just need to get from Point A to Point B. On typical days we drive less than 100 miles. Occasionally we will hit 200 miles, but not often. We’re in no hurry, except to outrun the cold weather, so why rush? We encountered more destruction from Hurricane Irene and Tropical Storm Lee as we drove south through New York State. As we crossed into Pennsylvania, it was even more evident. We were less than fifteen miles from our campground when the road into the Delaware Water Gap area was blocked off. We had to make a detour around and later found out that a major failure of a section of the road had been discovered just within the last few days. Apparently there is a lot of damage to the area where we will be visiting. We’ll see tomorrow. In the meantime, we are enjoying a beautiful campsite at Dingmans Campground, which is operated by a concessionaire of the National Park Service. It even has hookups and is practically empty. The only way it could be better is if we could have internet and/or TV reception. Our visit to the Hudson River Valley has been an immersion in history and architecture. There are so many historic house museums in this area that it would take a month to see them all. Instead, we narrowed our focus to those that are units of the National Park Service. That was an easy way to pare down the list. Yesterday we visited the home of Franklin Delano Roosevelt, and today we toured Eleanor Roosevelt’s home, Val-Kill, as well as the Vanderbilt Mansion. What a contrast between the two families’ houses. We started at the Vanderbilt Mansion National Historic Site, one of the grand “cottages” of the Gilded Age. This was the home of Frederick Vanderbilt, grandson of Cornelius Vanderbilt, and his wife Louise. By Vanderbilt standards, this is a modest home. Compared to FDRs home, however, it is huge, opulent and showy. Like FDR’s home, it was occupied only during the spring and fall months. It is an amazing house, although I prefer the exterior to the interior. Both Tim and I did admire the beautiful green marble in the entrance hall, however. The property includes one mile of frontage on the Hudson River, and the views from the grounds are incredible. The Eleanor Roosevelt National Historic Site, known as Val-Kill, could not have been more different than the Vanderbilt Mansion. Val-Kill is a modest home that reflects Eleanor Roosevelt’s personality. It is very homey, with low ceilings, paneled walls and comfortable furniture. Photographs that tell the story of her life, as well as photos of visitors to the home, decorate the walls. ﻿This house was her retreat, and it was in this house that Eleanor spent her days working. It was also her residence after FDRs death until her own death in 1962. ﻿I left Hyde Park, New York, feeling that I now have a real understanding of Franklin and Eleanor Roosevelt, their lives and contributions to the world. I probably learned more from visiting these historic sites than I have from most others that I’ve been to. Tim and I drove north from Hyde Park, through Rhinebeck, and we stopped at Bard College in Annandale-on-Hudson to see the Fisher Center for the Performing Arts, designed by Frank Gehry and somewhat reminiscent of his Guggenheim Museum in Bilbao, Spain. It was not open for tours, but the exterior was worth the visit. The day was slipping away, so we crossed the Hudson River and turned south. We are staying at a decrepit campground south of Kingston that seems to be falling apart. The hookups and bathrooms have been somewhat updated, but that’s about it. It almost reminds me of a campground junkyard, with all of the discarded and broken items lying around. Oh well, we needed hookups tonight, the campground was open and the location was good. We’ll survive one night.